Newark businesses and businesses throughout the East Bay can turn to the professional fire extinguisher services offered by AAA Fire Protection Services. We help you comply with California's complex fire code. Our fire extinguisher services include annual inspections with updated tagging so that governmental agencies can see your business is in compliance. We also offer fire extinguisher sales and offer a wide selection of fire extinguishers which helps you make sure that your business has the right type of fire extinguisher in place. 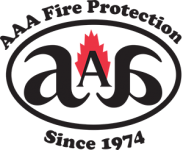 AAA Fire Protection Services has been in business for over four decades and we work with businesses of all sizes. We are a leader in fire suppression and fire protection services, including comprehensive fire extinguisher services. We help businesses every day ensure that their fire extinguishers work and that they're ready for use in case of fire should occur. If your business would like more information about working with our company, just give us a call at (800) 543-5556. Our professional team will happily answer your questions or provide you with detailed information and a price quote specific to your business.